Join the Holiday Cheer at Bardstown Road Aglow! 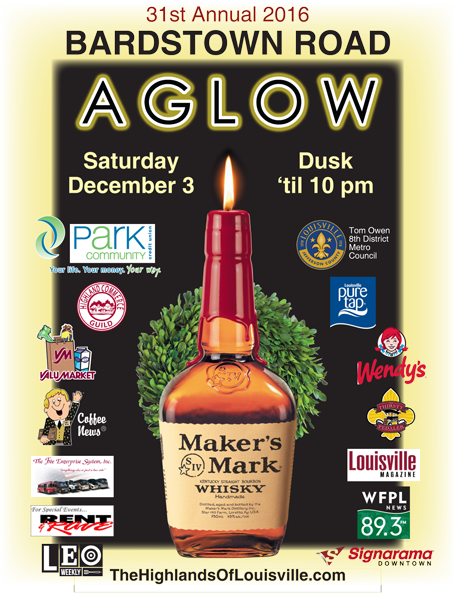 Grab your friends and family and come out to celebrate the 31st annual Bardstown Road Aglow this Saturday, December 3rd from dusk until 10pm. This is an event that has something for all ages! Many shops are staying open late to celebrate the season. This year, some participating restaurants will feature a signature holiday drink in a special mug dipped in Maker's Mark green wax for $10 each, with all proceeds benefiting WaterStep. There is also a free trolley hop from Douglas Loop to Lexington Rd that features live music during the course of the night. Shannon Cogan from WAVE 3 will be at Wendy's from 5:30-6p for the tree lighting ceremony. Wendy's will be providing free coffee and hot chocolate during the ceremony. Local celebrities such as Kirby Adams, John Timmons, Vicki Rogers, Connie Leonard, Kent Taylor, Carolyn Greer, and Sara Havens will be judging the holiday store decorating contest at participating locations. Polar Palooza will be at the corner of Bardstown Road and Eastern Parkway from 6-8:30p. This event is sponsored by Park Community Credit Union and will feature selfies with Parkie the Dog and Santa, as well as face painting and a band. Another fantastic stop on Bardstown Road is St. James Catholic Church. Starting at 6p and continuing throughout the evening, there will be various choirs performing, such as: St. James School Choir, St. James Singers Parish Choir, Louisville Brass Quintet, and Bellarmine University Schola Cantorum. Refreshments such as cider and snacks will be offered on the steps of the church. From one end of Bardstown Road to the other, Bardstown Road Aglow is a fantastic way to spend your Saturday night. Enjoy the company of family and friends, support local businesses with holiday shopping, and top it off with food, drinks, and lots of memories! While you're strolling down Bardstown Road, don't forget to peek down the side streets - maybe you'll find a glimpse of your next home! Family Realty can help you with all of your real estate needs - call us today!